DETAILS: The ultimate luxury getaway awaits at 151 Snowdrift Road. This incredible new construction home offers vast ocean views, an enormous pool, and incredible accommodations for 30 guests. With 8 bedrooms and 8.5 bathrooms, this home is perfectly outfitted for your multi-generation or multi-family vacation! On the first floor are two guest bedrooms—a queen bed guestroom and a king bed guestroom—each offering a private bathroom with a glass-front shower. A spacious game room provides hours of entertainment and fun for your guests and leads to the incredible lanai and outdoor oasis. This home boasts a huge private pool (which can be heated seasonally from October to May), a hot tub, a spacious pool deck, and a convenient outdoor kitchen. The second floor presents an open-concept floorplan to combine the living, dining, and kitchen areas. Two sets of pocket sliding glass doors allow natural light to fill the space, creating a bright and airy ambiance and sweeping views of the emerald coast. Guests can relax on the plush furnishings—including two queen sleeper sofas—in the living room and enjoy a vacation movie. The dining area offers two large wooden dining tables with ample guest seating. The gourmet kitchen will delight home cooks and food enthusiasts and boasts premium stainless steel appliances, a gas range, and ample counter and cabinet space. Also on this level are two beautiful guestrooms. The first guestroom features a king bed and a private bathroom with a shower. The bunk room offers a king bed, a twin-over-twin built-in bunk bed, and a private bathroom with a shower. The third floor houses most of the home’s guestrooms and offers a variety of sleeping options. Guests can choose from three king bed guest rooms (two with private bathrooms and one with a shared bathroom), a queen sleeper sofa, or two sets of twin-over-twin built-in bunk beds in the bunk room. The final bedroom in this incredible home is the magnificent master suite, which features a luxurious king bed and a private en suite bathroom with a shower and a separate soaking tub. The home’s three levels can be easily accessed with the in-home elevator. 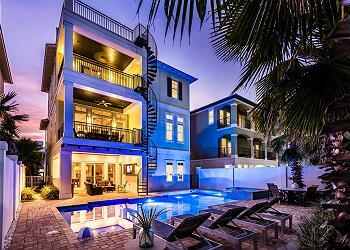 This exquisite Miramar Beach home is not to be missed and is sure to be the perfect place for your large-group vacation. 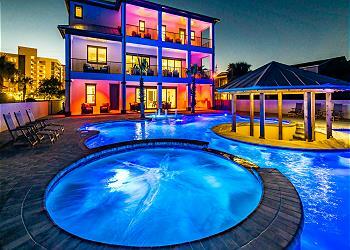 Parties, weddings or events held at the property must be pre-approved in writing by 360 Blue.